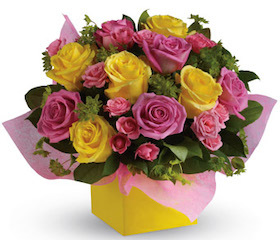 Order online here and get hassle free delivery of flowers and gifts. Search our categories like Celebration, Sympathy and New Born Baby as well as flower types like Bouquets, Arrangements, Roses and Plants. We have also made it easy to choose a gift including a balloon or have the flowers arrive already in a vase. Shop floral orders on Valentine's Day and Mother's Day, and Gourmet Gift Baskets around Christmas time and Father's Day are in peak demand, so please place online orders ASAP! 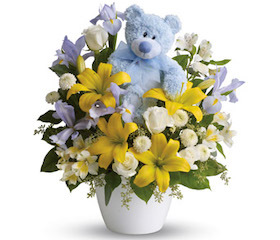 Order before 2 pm Monday to Friday, 10 am Saturday and get the flowers delivered today to most cities and larger towns. A burst of brilliant flowers designed to make their spirits soar! 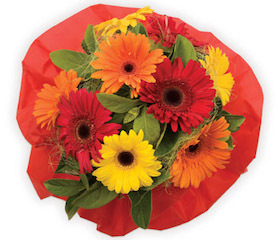 This spectacularly colourful bouquet includes lilies, gerberas and roses. Bright Lights flower bouquet consistently outsells everything else. Simple, Colourful and Cheerful! At FloristNZ.co.nz (FNZ) our florist Network specialises in deliveries either the same day for most larger towns and cities or the next day delivery for some smaller towns and rural areas. This efficient service means you can rely on us to get your floral requirements delivered promptly to virtually the whole of New Zealand and means the arrangements will arrive looking beautiful and fresh. Our extensive range of gifts are hand designed and arranged by local florists and cover items suitable for every occasion and will fit into any budget. If you prefer bright and sunny floral bouquets for birthdays and celebrations or traditional classic arrangements for anniversaries and formal events, we have it covered. Partners can choose a single red rose on Valentine's Day, yellow roses for the 25th wedding anniversary, a festive table arrangement at Christmas time, employers don't forget to send your PA or Secretary flowers on Secretaries day on the third Wednesday of April, or a mixed bunch arrangement to say happy birthday. To celebrate the arrival of a newborn baby, we have created a cheerful range with useful practical gifts for the baby along with lovely flowers to display in their home. These can be delivered either to the hospital or family home. Alternatively, a baby gift basket or a gourmet food hamper for all the family to enjoy goes down a treat! Recently we added a range of flowers delivered in a glass vase or colourful box which has become very popular. Each time the recipient puts fresh flowers from the garden into the vase, they will have the fond memory about receiving the gift from you. An often overlooked gift category is sending a living potted plant; the advantage to this gift style is it keeps on giving for years to come. These can be either an elegant foliage style house plant or one that flowers in the right season. At FNZ, we create beautiful funeral wreaths and casket sprays to help you show your deepest sympathy and respect. We can also deliver your floral tribute directly to the church service, retirement home or nursing facility. With such a large network of local florists, we have the reputation for same day delivery that is hard to match in the florist industry online. Order prior to 2.00pm Mon to Fri and 10:00 am Saturday. Note these times are in the recipients time zone, not where you order from. 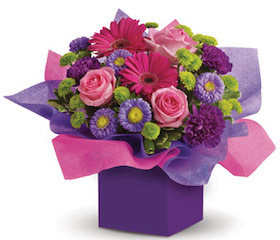 We can guarantee fresh flower delivery to most parts of New Zealand. And even the same day for some of the common gift baskets to New Zealand's major cities. Remember it is not just people's homes we can deliver too, also hospitals, churches and funerals, Rest and nursing homes, business and charity premises, company and office functions. In fact almost anywhere with an actual physical address. So browse the flowers and gifts, click "Buy Now" to order online with our easy and convenient secure booking system. Place any preferences you have for your order in the comment box, write an appropriate message for the card that gets delivered with your gift choice and you can feel rest assured that since 1926 the team of member florists have been designing fresh colourful and unique displays using seasonal and imported flowers that are great value for money. For shoppers that are short on time or just cannot choose, we have a Designers Choice in each of the main categories or simply click "Quick Order" and receive the freshest best value arrangement available on the day from a member of the longest running service in Australasia and in fact one of the first pioneer services in the world. With same day access to Auckland, Christchurch (NZ), Dunedin, East Coast Bays, Gisborne, Hamilton, Hastings, Invercargill, Lower Hutt, Manukau, Napier, Nelson, New Plymouth, North Shore (AKL), Palmerston North, Porirua, Rotorua, Tauranga, Timaru, Upper Hutt, Waitakere, Wanganui, Wellington, Whangarei and many other towns in NZ, as well as Australia and the United Kingdom (UK) for international overseas deliveries, you have come to the right place.